The Saucy Awards totally deserved a Saucy cocktail (thanks to Campari America). Photo via Facebook. 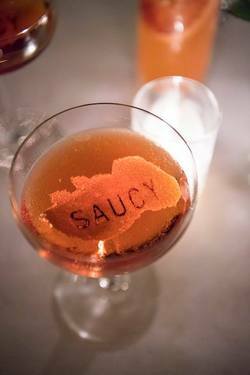 On Monday November 6th, The Saucy Awards will return to celebrate the best of the Bay Area’s restaurant and hospitality community, and you are an important part of the nominations! You have until October 1st to nominate people for categories like Manager of the Year, Exceptional Non-Brick & Mortar Restaurant of the Year, Sous Chef of the Year, and more. There is also a People’s Choice Award presented to the public’s favorite restaurant of 2017. Nominations are open to all eligible establishments—Golden Gate Restaurant Association (GGRA) members or otherwise—within six Bay Area counties (Alameda, Contra Costa, Napa, San Francisco, San Mateo, and Sonoma) that can nominate themselves and/or one another. The Saucy Awards Steering Committee, formed of a group of industry luminaries, will narrow the field to four final nominees for each category. Restaurant members of the GGRA and all nominees will be provided a ballot to vote for the final winners. To ensure unbiased and fair results, an independent accounting firm will tally and process the votes. You can look at the full list of last year’s winners on the GGRA’s website. And mark your calendar for The Saucy Awards gala on November 6th—see you there!